Organ harvesting has become a new form of execution for political prisoners in China in recent years, according to a new book by a longtime China analyst and human rights investigator. Ethan Gutmann discussed his new book, The Slaughter: Mass Killings, Organ Harvesting, and China’s Secret Solution to Its Dissident Problem on Tuesday at the National Endowment for Democracy. Gutmann estimates in the book that about 65,000 practitioners of the Falun Gong religion, a spiritual discipline now banned in China, were killed for their organs between 2000 and 2008. Tibetans and Muslim Uighurs, minorities in China long persecuted for their beliefs, have also been targeted, he said. Organ sales can yield hundreds of thousands of dollars in profits. Gutmann said the first politically motivated harvesting of organs occurred in the late 1990s after Chinese authorities cracked down on Muslim protests in Ghulja and throughout the western Xinjiang province in China. A young doctor said in an interview that he was ordered to take blood samples from political prisoners at a facility in Urumqi, the capital of the autonomous Uighur region in Xinjiang. The practice later accelerated at military hospitals. "A line had been crossed with the Uighurs," Gutmann said. "This is always a region where the line gets crossed." The Chinese Communist Party (CCP) leadership next set their sights on Falun Gong adherents, a religion that was initially sanctioned in China and even attracted soldiers and top party officials. However, CCP officials began to view the growing movement as a threat to the regime. Activists point to government statistics showing that organ transplants and transplant centers increased substantially in the early 2000s, right after Falun Gong practitioners began to face persecution. As many as half a million to a million Falun Gong adherents are believed to be in China’s Laogai prison system at any given time, Gutmann said. Among the extensive interviews Gutmann conducted for his book, he said the "smoking gun" was Dr. Ko Wen-je, currently a mayoral candidate in Taipei, Taiwan. Ko told him that he went to the Chinese mainland in 2004 to seek a better price for organ donations. Officials at a hospital he did not name invited him to drink heavily with them one night. The next day, they told him that they could offer "nothing but the best" organs from Falun Gong prisoners, who the officials said were healthy and do not drink, according to Ko’s interview. 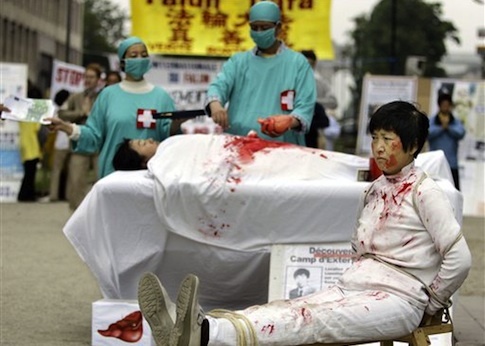 The practice of organ harvesting extended to the upper echelons of Chinese leadership, Gutmann said. Wang Lijun, a close confidant of former top party official Bo Xilai, received an award in 2006 for overseeing thousands of organ transplants at the "Jinzhou City Public Security Bureau On-site Psychological Research Center." He called the practice "soul stirring" in his acceptance speech. Interviews Gutmann conducted as recently as last year suggest the harvesting "has not stopped," he said. He urged Congress to speak out about the issue and take steps to prevent U.S. citizens from traveling to China for organ transplants. A House resolution introduced last year recommends that the State Department issue such a travel warning, and place visa bans on those involved in organ harvesting. "If the reigning superpower of the world will do nothing, then why should anybody else?" he said. Israel is the only country so far to forbid its citizens from receiving organ transplants in China due to alleged reports of harvesting, Gutmann said.